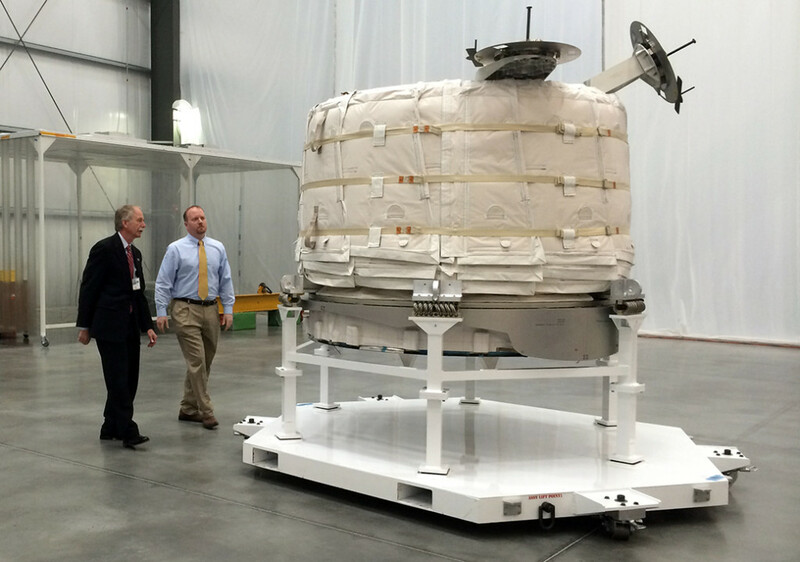 March 13, 2015 – NASA and Bigelow Aerospace are preparing to launch an expandable habitat module to the International Space Station this year. The agency joined Bigelow on Thursday, March 12 at its Las Vegas facility to mark completion of the company’s major milestones. The Bigelow Expandable Activity Module, or BEAM, leverages key innovations in lightweight and compact materials, departing from a traditional rigid metallic structure. In its packed configuration aboard SpaceX’s Dragon spacecraft launched on a Falcon 9 rocket, the module will measure approximately 8 feet in diameter. Once attached to the space station’s Tranquility Node and after undergoing a series of hardware validations, the module will be deployed, resulting in an additional 565 cubic feet of volume — about the size of a large family camping tent — accessible by astronauts aboard the orbiting laboratory. Expandable habitats could be a new way to dramatically increase the amount of volume available to astronauts while also enhancing protection against radiation and physical debris. Innovative advances in efficiency provided by expandable habitats may give the nation new options for extending human presence farther into the solar system, both in transit and on the surface of other worlds, while also supporting the development of innovative platforms for commercial use in low-Earth orbit. In the next decade, NASA plans to extend human spaceflight from low-Earth orbit operations to “proving ground” operations in cis-lunar space orbiting the moon. In the proving ground, NASA and its partners will validate vital hardware, including deep space habitats, as well as operations and capabilities necessary to send humans on long-duration missions to Mars or other deep-space destinations in which they must operate independently from Earth. The International Space Station serves as the world’s leading laboratory for conducting cutting-edge research and is the primary platform for technology development and testing in space to enable human and robotic exploration of destinations beyond low-Earth orbit, including asteroids and Mars. Once BEAM is attached to the Tranquility Node, the space station crew will perform initial systems checks before deploying the habitat. During the BEAM’s minimum two-year test period, crews will routinely enter to take measurements and monitor its performance to help inform designs for future habitat systems. Learning how an expandable habitat performs in the thermal environment of space and how it reacts to radiation, micrometeroids, and orbital debris will provide information to address key concerns about living in the harsh environment of space. The BEAM is an example of NASA’s increased commitment to partnering with industry to enable the growth of the commercial use of space. Bigelow Aerospace is building on technology NASA conceived in the 1990s and licensed to the company. NASA and Bigelow Aerospace are each benefitting from the sharing of expertise, costs, and risks to pursue mutual goals. The module is scheduled to launch on SpaceX’s eighth cargo resupply mission to the space station later this year.